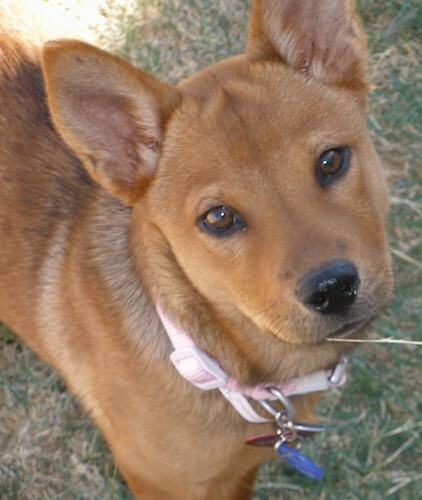 "This is Isis, a 1 year old chow/shiba inu mix. She was rescued from an animal shelter. She is a very laid back dog, though she does enjoy about an hour of exercise a day. She has short fur but she does have the thick chow wool like undercoat and requires a good brushing once or twice a week. She is very social with other dogs and people. She does play rough with other dogs and likes to sneak up and ambush them. She has a hunting instict and is a digger. She also will tear up stuffed animals or a newspaper if it is left where she can get it. She is VERY intelligent and has figured out how to jump up on counters to pull things down. She is a dog you have to stay one step ahead of. She has an all blue tongue like a Chow, as well as the undercoat and the eyes. She is also very protective of her family, like a Chow. 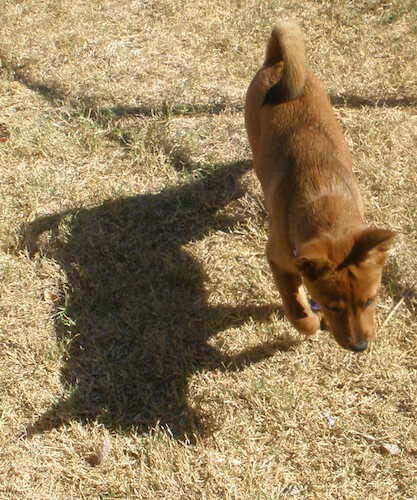 She is medium sized, about the size of a Fox Terrier and weighs 35 lbs (15.8 kg). A little larger than a Shiba Inu but now quite as large as a Chow."